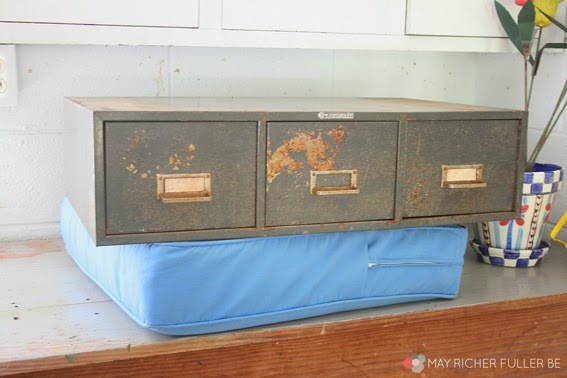 About a month ago, I happened upon a really sad looking, rusty three drawer metal card catalog on the side of the road. I couldn't resist the urge to stop and pick it up, so I did, not quite knowing what I'd do with it. I knew it could be awesome with a new paint job - there was so much potential for this cool vintage card catalog! Then it dawned on me - what if I put legs on it and turned it into a side table? I looked into metal hairpin legs, but the total price for the four I wanted ended up being more than I was willing to spend, so it was back to the drawing board. 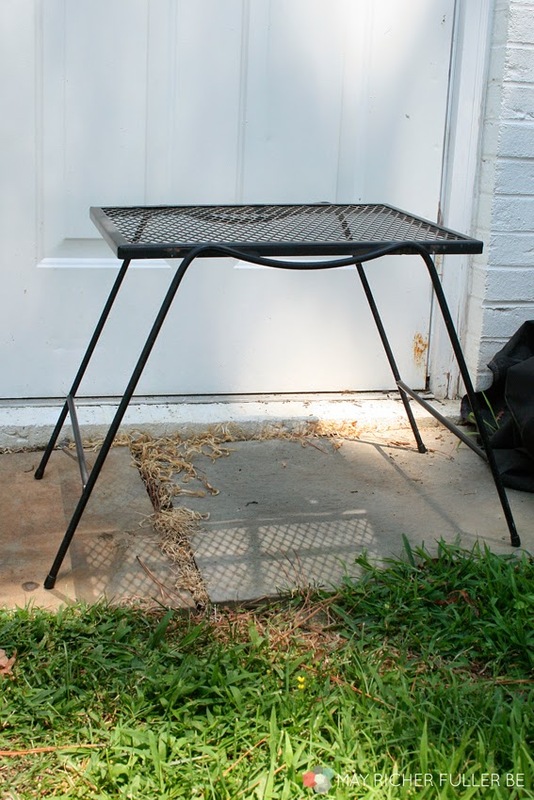 I started thinking creatively about what I could use for a stand and then I came across the perfect black outdoor iron table at an antiques mall nearby. The legs were a very similar style to the hairpin ones I'd been looking at and the price was much friendlier :). 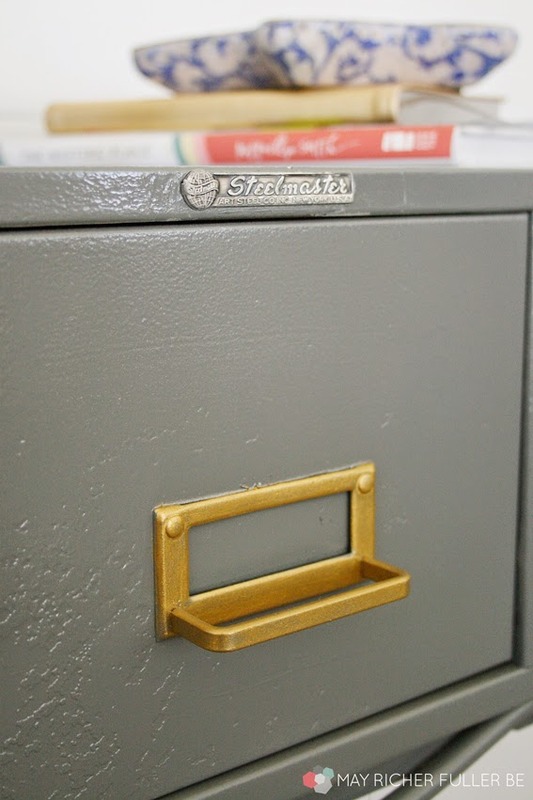 The dimensions were right on target for the card catalog to sit on top - it was like they were made for each other! Rust and flaky paint was the name of the game here. 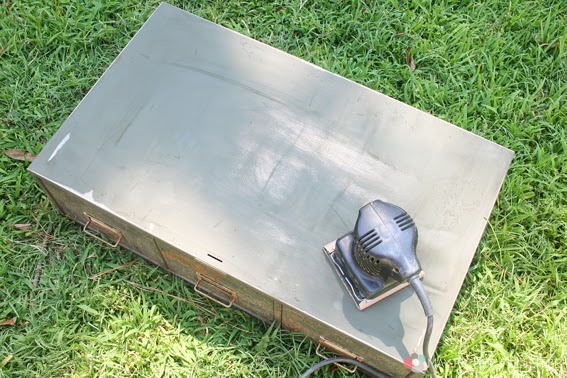 It had definitely seen better days, so I gave it a good sand with some rough sandpaper to get rid of some of the rust and smooth out the surface. I managed to get much of the rust and flaky paint off (there were some areas that just wouldn't sand out), and I'm actually really ok with the imperfections that were left. Then it was time for a new coat of paint. I primed it with a couple of thin coats of white primer (Kilz water-based) and then chose Krylon's "Smoke Gray" spray paint for the color. It took nearly two cans and four thin coats to get the coverage I wanted, but I LOVE the color and the satin finish. 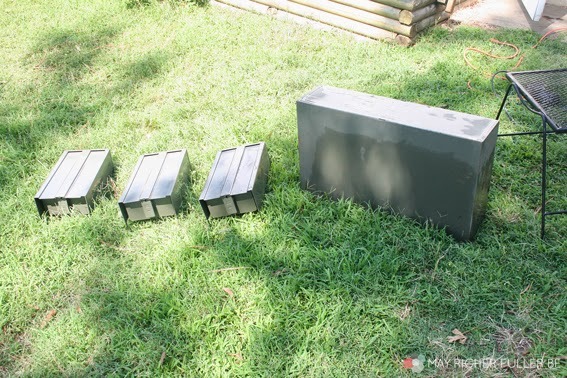 For the base (the outdoor table) I didn't prime or sand - all it needed was two coats of the smoke gray spray paint. 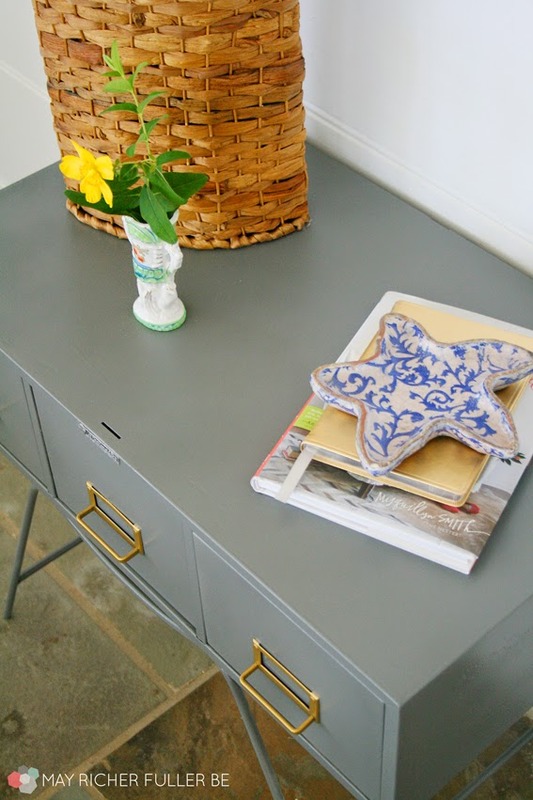 The only tricky part I had to deal with when it came to painting was the drawer pulls. They weren't removable, so instead of trying to cover them up and spray paint around them, I painted them the same smoke gray color and then painted them with some gold acrylic craft paint (using a craft paint brush). I was a little nervous about how they'd turn out, but the technique ended up working beautifully! They almost look like brass. 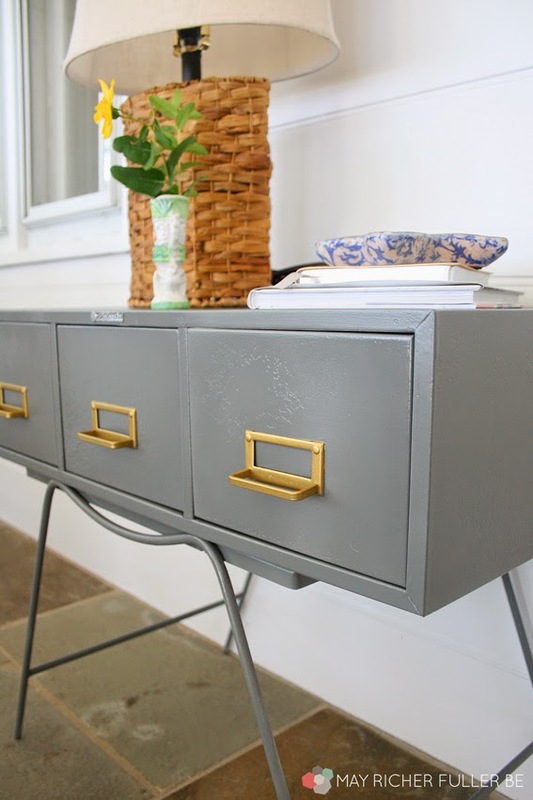 Once everything was dry, I put the card catalog on top of the outdoor table and I was done! I think these two pieces were made for each other. I'll probably screw the two together at some point in the future to make sure the top stays attached, but it's just resting on top for now. I'm not sure where this lovely table's home will be once we move to Philadelphia, but I can't wait to incorporate it somewhere. I'm thinking it might be a great bedside table for our guest room. Not too shabby for a roadside pickup, huh? I think the gold pulls are my favorite part. What do you think? Would you put a piece like this in your home? That's the best trash to treasure that I've seen in ages! And you are right in saying these two pieces were made for each other. I call that a God- thing. God delights in doing things like that for us. I love the gold pulls and the metal tag on it. 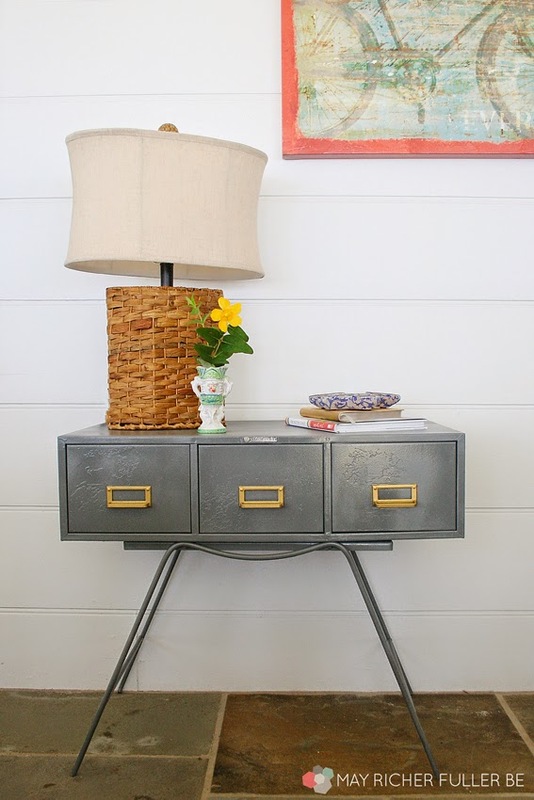 I think the side table should be out in the living area because it's such a conversation piece. Your place in Philly looks fabulous, btw. This is adorable Chaney!!! I love the color too! So creative! Wow! I would never have guessed that that was 2 different pieces. Love this and I'm sure it will find a great home at the new place. It has too, cause it is awesome! Thanks for linking up with us at The Makers. We are thrilled to have you join the party! This is AWESOME. What a great save. Love how you paired the two pieces! What a perfect pair! 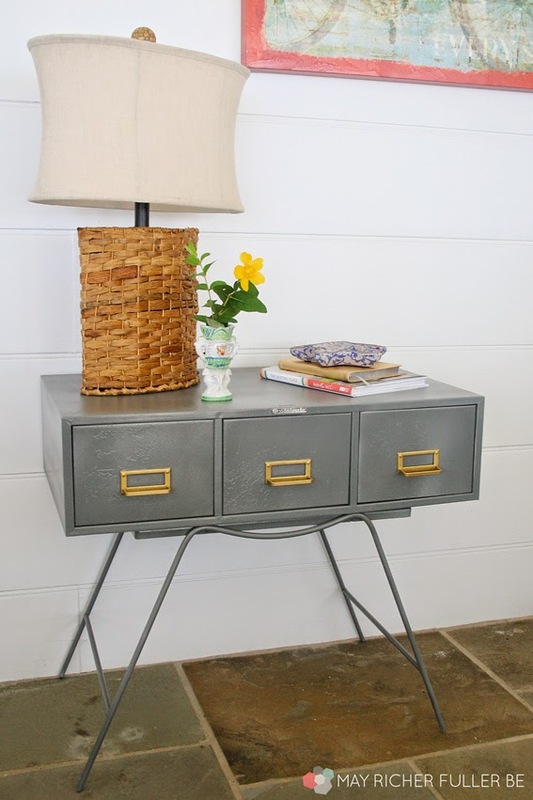 They make an adorable little sidetable! These two were meant for each other! Love how you actually saved money by finding an already made table rather than buying the parts. So much easier too! this is the perfect union! love it! You are a smart cookie - I love the vintage vibe and the unexpected base!! Such a fun unique piece and you have it styled to perfection! And the gold hardware, so good! Thanks so much for sharing at Best of the Nest! That was some stroke of luck to find a base that fit your card catalog so perfectly! I truly love how it turned out!! Thanks, Kris! I know - that base was definitely a lucky find. I found it at the first place I looked too! This is SUCH a cool project! SO creative! This is to die for...... Love this piece! 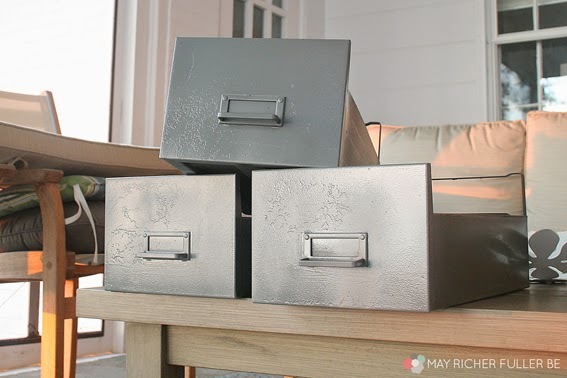 I have 3 sets of old metal drawers a little smaller than the one you have. I haven't tackled them yet because I didn't know how to deal with the drawer handles. Great idea! Thanks so much for the post. Love it!!! 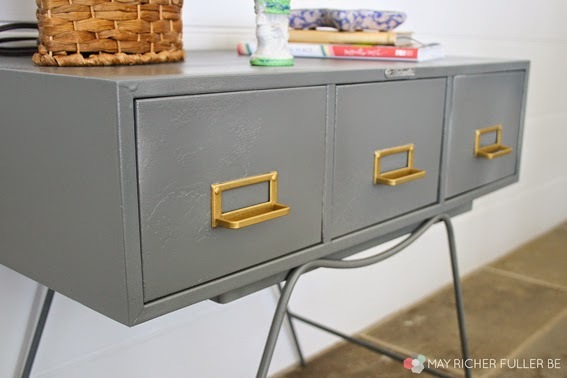 do you mind sharing which craft paint you used for the handles?